These pictures were taken on Friday on campus after I picked her up from the airport and she got to drop off her luggage at my apartment. My friend tagged along so we enslaved him as our photographer for a bit. 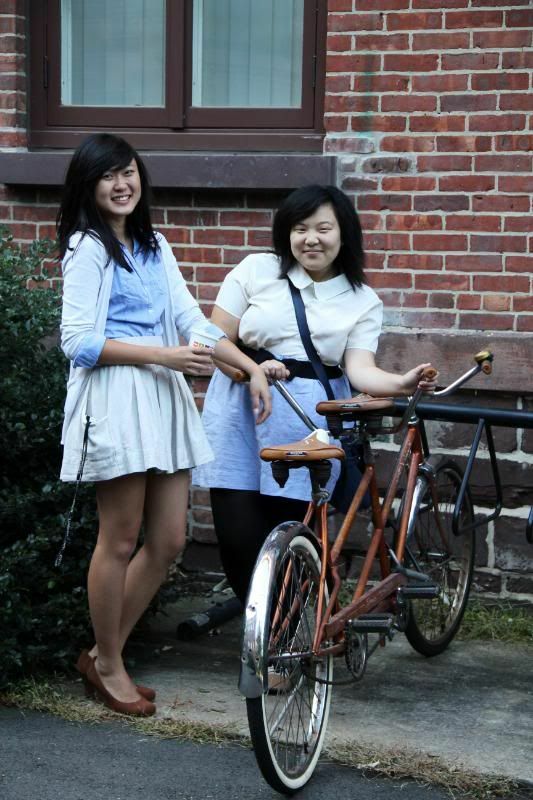 We accidentally ended up with inverse outfits that day; I had chambray on the top and she had chambray on the bottom. 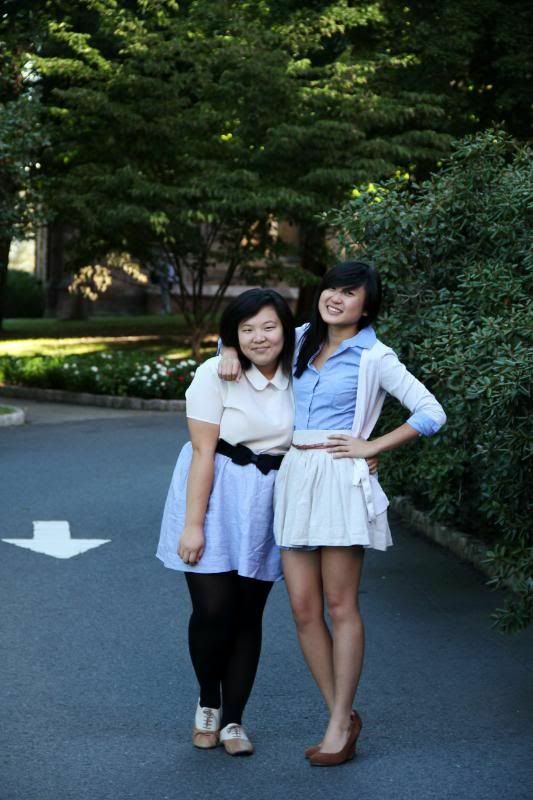 (And how adorable are her oxfords?) 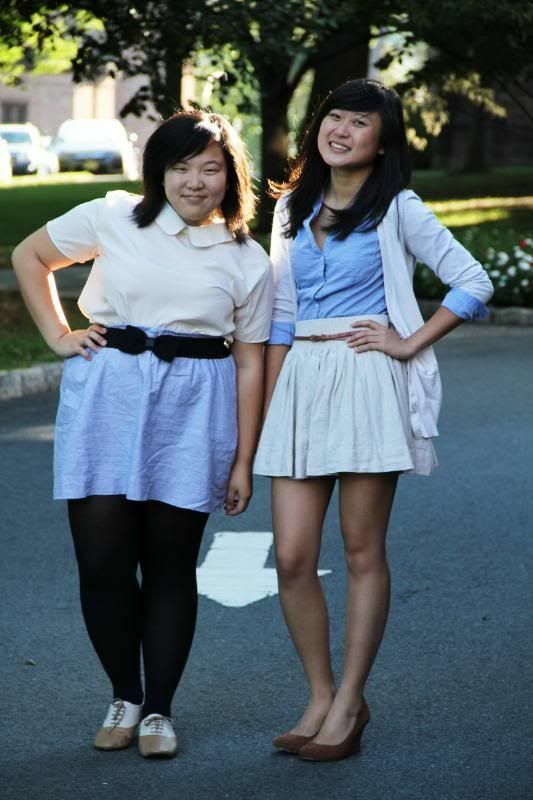 I know you guys love the second picture where we're doing the standard blogger pose. So after taking these photos, Jasmine took off for NYC to see a few fashion shows while I headed off to class and then a few hours of work. 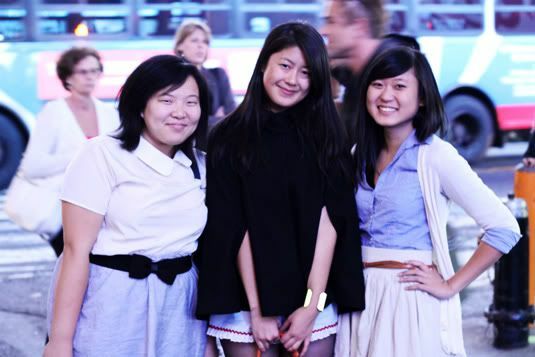 We were able to meet up again in the evening with Jenny from Fashion for Writers! We got this extremely awesome Brazilian guy to take our photos. Jenny noticed he had a DSLR so we figured he'd know what he was doing with my camera...and turns out he did! I can't wait to show you guys pictures from the rest of the weekend. I'm so exhausted and my feet are twitching with pain but it was so worth it. Get ready for a whole bunch of pictures; you guys will be doing a whole lot of scrolling! It's Jasmine's last night here before she boards for the airport early tomorrow morning. We'll probably do some late night photo exchanging and bonding...or we'll both just pass out. I actually have homework I need to get done for class at noon today. Time to snap back into reality! Yay united at last! You two are adorable here, and I love your inversed outfits! Hope you had fun this weekend! finally you guys are together! looks like your both having so much fun, wish I was there. finally, the two of you are together! you both look sooo adorable! and the photos are amazing --- the soft afternoon light at the back just frames each of you. So nice to see bloggers meet up who seem like such good friends. Both your outfits are so cute and the matching is funny, you must be psychically linked! i hope you guys had a blast together ! Aww the pictures look great, and it sounds like you guys have been having a heap of fun :) Can't wait to see more. You are so cute, and you didn't even plan your coordinated outfits -- too funny!! Glad you are having an amazing time at fashion week! Aww, you're all so adorable! It was so amazing to "meet" you yesterday and catch up! Ah, so fun! Wish we could all do this way more often! i miss this :( it's been so weird today adjusting back to life communicating through everyone online or texts and having to wait another year or so to see each other again. You girls all look so cute! Hope you like my post on jumpsuits and follow my blog too! You two looked so cute together. I love the pastel color scheme on your outfits..
this is super exciting hehe. This is so cute! I'm glad you got to meet up in the real world!